So I didn’t get much knitting done over the weekend, I was too distracted by my wonderful new blog. I still can’t believe I have my own domain name! This is endlessly amusing to me. I’ve got about 5 pattern repeats to go on the foot of my 2nd Monkey sock. I’ve been doing 6 repeats, and I have about size 8 (sometimes 8.5) feet. For reference, about 9.5″ long. I hope to finish that sock this week. 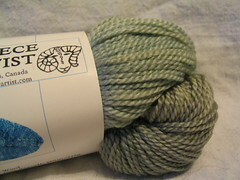 My next sock project will use the wonderful Fleece Artist yarn you see to the left. It is going to become the Vinnland socks from the Anti-Craft. But first, I think I’ll work some more on the $1.50 cardi. The Monkey socks weren’t supposed to take all my attention away from it, but they did. I’m at the start of the shoulder decreases at the back, so I’m almost done the big annoying piece. The fronts are different, so that’ll be fun to do, and then I just have one sleeve left! I think putting all that time inbetween sleeves helps eliminate that boredom of Sleeve Island. As long as you take good notes on the first one, so they can match. I also want to tell you about a wonderful thing I discovered for printing patterns off the internet. The booklet function on my work printer. I was poking around, trying to find the ‘print double-sided’ setting, when I noticed a box that said ‘booklet’, I tried that, it is is great! It prints it out, 2 pages to a sheet (so yes, the text is kinda small. I can still read it easily though) and double-sided, so if a pattern would be four pages normally, this uses only one piece of paper. You just need to fold in half, and possible staple if it has more than 4 pages. They’re just such cute little books! And they fit better in a knitting bag than an 8.5″x11″, they’re little 8.5″x5.5″ booklets that are just too cute. And so far, on all the ones I’ve printed, the cover page has worked out perfectly with just the title, picture, and designer’s blurb. So if you have a fancy printer with a booklet setting, I say use it! You’re saving paper too! This entry was posted in Knitting, Socks, Sweaters and tagged dollar and a half by rycrafty. Bookmark the permalink.